Wondering who and what are disqualified parties to your self-directed IRA? Learn about the restricted parties, and how to get around them in your real estate IRA investing from the best in the industry, David Moore! 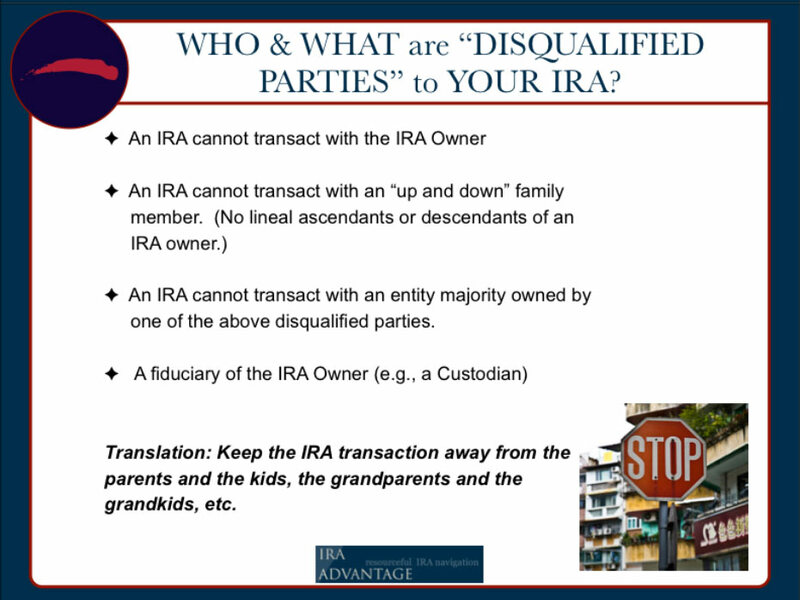 WHO and WHAT Are Disqualified Parties To Your IRA? So the investment is rarely the problem. What causes transactional problems is transactions between or for the benefit of the disqualified party. So who’s the disqualified party to your plan? Well you are. Let’s say you have a traditional and a Roth IRA, those two plans are disqualified parties not only to each other, but to you as well. A spouse, parents, grandparents, kids, grandkids, their spouses or any legal and not in control by one of those. So just we want to stay away from the family. Now what’s interesting is siblings are okay. So if I want to swap properties or buy a property from my brother for example, I could use my retirement account to go buy him a property to live in. Can I do the same thing for my mom? No. So siblings, aunts and uncles, cousins, those are all fine. How about an entity I have a controlling interest in? That is a no. But if I’ve got a low enough interest in it then the answer would be okay, yes. What interest percentage is that? Less than 25? Well, depends who you’re talking to. I would say probably 30% or less would be okay. If you want to argue about it you could probably argue that anything under 50%, and also controlling interest. But I think the lower the better. When we were in the crash we had builders that wanted to buy our land, because they knew the land was literally dirt cheap in those days right? But they didn’t know when they were going to be able to build on it. 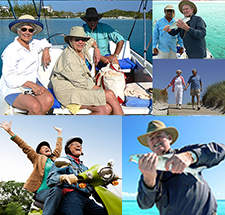 So what we do is create the retirement account in a matter that would allow them to go and make that investment. But then the next question is well they want to build on it, can they sell or build on something that the retirement account owns? The answer is no, so we create another limited liability company and put the disqualified party in a minority interest, and in those we were trying to keep it under 30%. In those situations then they’re a part owner of this other thing, minority interest, therefore it’s not a profited transaction between disqualified parties. So you’re just bringing in other people to get it taken care of. The controlling interest is the trigger, as long as you don’t have control. As soon as you have control, you have party issues and you’ve got a problem. The problem with the problem with the retirement account, an IRA for example, is that if you do the wrong thing with an IRA, technically you’ve fully distributed the entire account’s balance as of the first day in the year in which the indiscretion occurred. A 401K plan is different, it’s only the money involved with the indiscretion that’s treated as distributed. There’s a big difference between those two and the consequences of a prohibited transaction. Either way you just don’t want to do it. We have people that say, “I want to go buy an apartment complex with my retirement account because I need more cash.” I understand that, we’d like to help you, but understand the only way you’re going to get the cashflow is by taking the cashflow as a distribution. You’re not going to be able to get your benefit in any manner while it’s owned by the retirement account. If we’re doing the tenancy in common structure, back to Quinn’s question earlier on ownership. If we’re talking tenancy in common structure of ownership, joint ownership between you and your plan, for example, we should have a tenancy in common agreement that spells out the rights and obligations of both tenancy in common owners. And we’d also want to make sure that we have a joint checking account that’s been funded at investment acquisition with money there so we can show that we’re not having money going in necessarily, but everything’s going out in that tenancy in common account and you can take distributions if you choose. But you want to make sure that any time those things are happening you’re going pro rata on ownership, on a distribution.